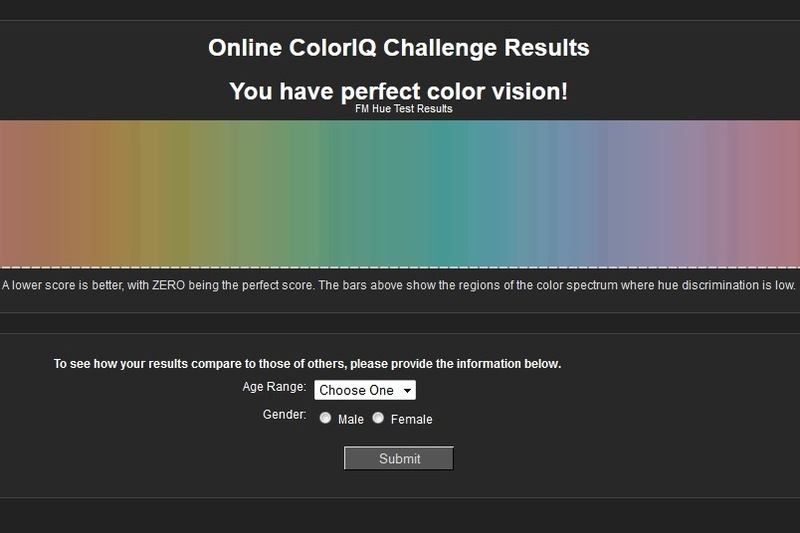 On one of my many visits to their site over the last couple of days, I read this post about a cool online color test. I love color, and if I’m really being honest, I love tests, too. So I took it. While I was taking the test, which involves a great deal of leaning forward and squinting as you try to arrange these little color squares in order from most red-ish to most green-ish, my kids kept coming up and asking me stuff. It may have even been important. But I shooed them away because I secretly wanted to do well. All my efforts paid off, because the test told me I didn’t get a single square out of place. It took me a while to figure this out, though, because after 30 minutes of squinting at my monitor, I could no longer see straight. I spent the next half hour vigorously blinking and hoping that the damage wasn’t permanent. So! Take the test! It’s fun! But try not to burn out your eyeballs.